Each of these South Boston based teams were in search of their second win of the season, which added to the intensity and excitement of the encounter. It was the Tones who came out on top and deservedly so. A performance that was full of heart and determination, and a back line that closed down the spaces for the speedy McAnespies corner forwards were the keys to a big win for the Blue side of Southie. The Tones were full of purpose right from the throw in. With 20 minutes gone the blue team held a three point lead. Attacking from the back line, the Tones converted possession into six points. Thomas Moolick got the ball rolling in the first minute, and was followed by Danny Egan, Charles McCarthy, Jason Hickson and Gary Brilly as once again all the Tones forwards showed they are capable of putting the ball between the posts. McAnespies found their way back into the game eventually. Luke Kelly at center forward and both corner forwards Jamie Doolan and Francis Burke started to motor. Kelly at center forward looked to be a key addition to the McAnespies team, and when on the ball the man from Clara county Offaly looked strong. Each player pointed to level the scores coming up to the break. Kian Cleere with Luke Kelly in pursuit. The second half began with the teams tied at seven points each. There were changes made early on both sides, some by necessity and some by choice. The Tones continued to attack from the half back line and strung together six points to one for McAnespies in a strong opening. Marty Farrell accounted for three points, Egan, Hickson and Martin Kelly the others. Now behind by five points. McAnespies had to find some kind of answer and introduced Cian McEnroe to the fray. The change began to pay dividends as Francis Burke and substitute Cathal O'Neill reduced the gap to three with 3 minutes left. It looked like there would be a grandstand finish after Mark Treanor made it a two point game with a few minutes to go, but it was the Tones with the strong finish as the crucial breaking balls were won by blue shirts. With a three point finish the Tones pull off a huge win for the club to get their second win of the season. Tones: C. Hynes, K. Cleere, S. O'Hagan, S. Higgins, J. Hickson (0-3), J. Gonoud, T. Moolick (0-3) J. Comerford (0-1), M. Farrell (0-1), G. Brilly (0-1), D. Egan (0-2) C. McCarthy (0-1) C. Joyce-Power. Sub: M. Kelly (0-1). Macs: P. Coakley, N. McGovern (0-1), E. Delmar, N. Gallen, G. O'Neill, E. Rigney, D. McKenna, S. Sherry, M. Treanor (0-3), L. Kelly (0-2), C. Tobin, J. Doolan (0-2) , F. Burke (0-3). Galway and Wexford served up a great game of hurling on a hot, heavy day at the ICC. It was the westerners who survived a second half two goal salvo from their local rivals in the final 10 minutes with Dan McCormack taking a couple of vital scores along with John Moylan to keep the distance between the teams. Galway had the stronger start of these Brighton rivals as Wexford tried to feel their way into the game. Galway opened up an early eight point lead. Galway's half forward line looked strong. Philip Ivors, Stephen Brown and center forward, Dan McCormack overpowered the Wexford half back line. Midfielder David O'Connor was on the mark with two early frees, while at corner forward John Moylan netted a goal following a rebound from Ivor's initial attempt. Moylan accounted for two well taken scores from play, and Galway looked like they would take over the game, but Wexford got into the swing of things to get back within touching distance. Tony Murphy, David Drake, Eoghan Kavanagh, and Simon O'Brien took some nice points. Just when Wexford looked like they would take the break within 4 points of their opponents, Galway struck with a blow just before the half when Stephen Brown goaled from close range and put the Westerners seven points to the good at the break. Galway and Wexford on Sunday. Wexford made a game of it in the second half and an early Tony Murphy goal after the sides had traded points made it a four point game. The ball into the big full forward looked like the plan for Wexford, as once the ball is in his hand the big man from Cork looked dangerous. Galway, however, got it back almost right away when substitute Pat Lupton was found all alone coming in on the far side and netted from close range. For Galway Dan McCormack was to the fore popping up on the half forward line for two critical points to maintain that lead. John Flynn-O'Connor gave Wexford hope with another goal for Wexford, and the lead was reduced to just one score goal after substitute Brian Glynce pointed. Galway were not going to be turned that easy though, and Ivors along with McCormack restored the Galway lead to five with less than five minutes to go. Wexford once again had hope after Glynce netted, but it was Galway who won the next crucial puckouts to see themselves over the line. Galway with maximum points from 2 games and Wexford still looking to get off the mark. Wexford: E. Spruhan, D. Redmond, M. McCafferty, J. Hoyne, P. Nolan, B. Dalton, S. Elward, D. Drake (0-4), J. Kehoe, E. Kavanagh (0-2), S. O'Brien (0-1), T. Murphy (1-3), J. Flynn-O'Connor (1-0). Sub: B. Glynce (1-1) Galway: P. Connors, P. Ryan, C. McGovern, E. Casey, D. Collins, A. O'Sullivan, B. Bergin (0-1), D. O'Connor (0-2), S. Brown (1-0), D. McCormack (0-4), P. Ivors (0-3), S. Curran, J. Moylan (1-3). Sub: P. Lupton (1-0), S. Curran (0-1). Kerry and the Shannon Blues played a tough, extremely exciting game that had the patrons on edge for the duration. It was a game reminiscent of the old rivalry that some may remember from the Dilboy era. The Blues had the advantage of an extra man for most of the game after a second yellow card was shown to wing back, David Clifford. The Blues had several chances to win it, but kicked wide when it mattered most, while Kerry lifted the siege with some great running and timely scores from Darragh O'Brien, Niall Sheehy and Joe Fitzpatrick to earn a point for their efforts. Kieran Hurley on the ball for the Blues. The Blues opened the game with a handful of missed chances, but finally hit the mark with a point from Barry John Keane who just joined the team. Kerry answered with a free kick that was pointed by Darragh O'Brien. The Blues were then gifted with a goal of the most unusual circumstances when a handpass intended for the goalkeeper missed its mark and ended up in the back of the Kerry net. Anthony Duffy added to the Blues lead, but then Kerry settled and strung together 5 unanswered points. There were two yellow cards issued as the temperature of the game matched the heat of the day. Niall Sheehy and Sean Moriarty were each cautioned as things threatened to boil over. A second yellow shown to wing back David Clifford resulted in Kerry facing most of the game a man down, and given recent results a Blues victory looked on the cards. Kerry did not let the setback dampen their spirits and even lifted their game. Corner forward Darragh O'Brien and Joe Fitzpatrick pointed twice each, while Sheehy added another for Kerry. At the break it was a one point Kerry lead, 0-6 to 1-2. Kerry's Aaron Hickey runs into a hard stop. Kerry got the second half off to the best possible start with a two goal salvo. The first came from O'Brien who fisted in a Joe Fitzpatrick cross. Immediately afterwards Sheehy blocked a handpass out of the Blues defence and with just the keeper to beat netted. Kerry were on their way to a shock victory- or were they? With Kerry legs tiring in the heat, and urgency mounting in the Blues camp the champions began to get their act together. After getting fouled Kieran Hurley got on the end of a short pass and cancelled out one of the Kerry goals. The Blues then leveled affairs with a five points to one run. Keane moved to a position closer to goal and looked more comfortable, and was certainly more productive on the scoring end. Four of the Blues points came from the boot of the Kerins O'Rahilly's man, the fifth point coming from Duffy. Kerry mustered up some energy for a final push however, and restored their lead to two points. The Blues regained the advantage after a well worked move ended in a penalty after Cathal McHugh was tripped in the box while shooting. Keane put the kick away and it was the Blues up by one. Both sides continued to work hard in the heat and traded points, O’Brien getting the critical scores for Kerry and Barry Hartnett popping up from wing back for the Blues, before substitute Colin Campion leveled matters. The Blues missed several chances to get the go ahead scores in the final minutes and will look back at the game wondering how they did not come out of it with both points. A great result from a Kerry point of view. The men from the Kingdom may have been quietly confident of pulling off a result before the game, but given the way it all played out will be very pleased with the draw. Blues: D. O'Brien, K. Hartnett, G. Ryan, B. Hartnett (0-1), S. Brosnan, S. Moriarty, D. Treacy, S. Kiely, A. Duffy (0-2), D. Dolan, BJ Keane (1-5), K. Hurley (1-0), C. McHugh. Kerry: P. Bailey, S. Driscoll (1-0), D. Larkin, E. Mullan, S. Cunningham, D. Clifford, I. Whelan, A. Hickey, J. Fitzpatrick (0-2), R. Kennedy, S. O'Callaghan, N. Sheehy (1-1), D. O'Brien (1-7). Sub: C. Campion (0-1). The Ladies senior football championship opened with last season's finalists, Connacht Ladies and Boston Shamrocks. It turned out to be a one-sided affair with Connacht Ladies storming the Shamrocks defences and not letting up. Connacht Ladies were in devastating form in their first outing on Sunday. It was a dominant performance from Connacht Ladies in the opening half. The back line had little to do as the midfielders and forwards went to work. The Connacht forwards found the open spaces and overwhelmed the Shamrocks defences, and were well supported by the midfield duo of Jacinta Brady and Aoife McGlone. After a couple of early chances for the Shamrocks it was Jane Ward and company who took over and putting the game beyond the reach of their opponents. A six points to one first quarter was the forerunner to the heavier onslaught that was to come. Goals from full forward Catriona Foley and 2 from Tyrone’s own Jane Ward had the Shamrocks reeling. Try as they might the Shamrocks could not hold up the rampant Connacht forward line. Points came from 5 of the six forwards, while the Shamrock's lone score was a free from Clodagh McGovern. It would be a long second 30 in store for the green and gold. In the second period the Shamrocks generated a goal chance or two, but Caroline Heraty managed to clear the ball when called upon. Lisa O'Brien managed a point in the Shamrocks column, but the second half continued along the same vein as the first. Another goal came from Sara Brady, and the ball continued to sail over Ali Cross's crossbar. Based on this performance it will be hard to see who can stop the champiosn from producing a repeat of last year’s victory. Shamrocks: A. Cross, B. Lockwood, C. McGinley, G. Bailey, E. McGovern, L. Larkin, F. Considine, S. O'Carroll, R. McHugh, O. Cullinan, L. O'Brien, K. Scanlon, R. Kelly, S. McGovern, C. McGovern. Connacht: C. Heraty, A. Kerr, E. Beirne, S. McAleer, M. Breen, J. O'Connell, H. Poff, A. McGlone, J. Brady, A. Fox, A. Ring, J. McDonagh, C. Donnelly, C. Foley, J. Ward. Galway opened their senior hurling championship with a convincing win over Fr. Tom Burke's. After a close first half Galway put their stamp on affairs in the second to run out winners by almost double scores. Tipperary men Bobby Bergin and Paddy Grace controlled affairs in the middle of the field as well as contributing several scores, and the back line closed down the spaces to keep Tom's from making any inroads. The forwards proved to be on the mark to put considerable distance between the sides by the time all was said and done. The opening period was evenly contested, though Tom's started the better of the 2 teams. After Shane Howley pointed, Sean Driscoll found the far corner of the net with his shot and Tom's were off and running with a four point lead. Galway soon settled and started to click. The Tribesmen started to gain an upper hand in mosSt areas of the field and Tom's goal was canceled out after Philip Ivors was pulled down in the penalty area. David Collins put the shot away and Galway had the lead. Four of the five forwards got on the scoresheet, and midfielder Grace picked off three points. John Moylan looked sharp at corner forward, and managed two points while Dan McCormack, Ivors, and Collins added to the tally. Tom's kept in touch with some well earned points from Shane Howley, Aodhan McEnrey, and Cormac Joyce-Power. At the break it was Galway by four, 1-12 to 1-8. Eoin Casey tries to break away for Galway. The second half saw Tom's battle hard in their own half back line, but each ball forward yielded little or nothing. There always seemed to be a maroon shirt under each ball sent into the Galway half of the field, and whatever chances Tom's had to shoot ended up wide of the posts. For their part Galway added 5 points to their total before Sean Curran netted a second goal with just over 10 minutes left. Tom's frustration bore itself out with yellow cards issued to Gordon Joyce and Ciaran Moore. Galway put the finishing touches to the game with Bergin, O'Connor, and Moylan rattling off a trio of points. A good start for Galway who will meet Brighton rivals Wexford next Sunday. Tom's: F. Keenan, R. Burke, T. Bowe, S. Coughlin, M. Deegan, G. Joyce, D. Lafferty, S. Howley (0-4), S. Driscoll (1-0), A. McEnrey (0-2), C. Joyce-Power (0-1), D. O'Mahoney (0-1), M. Dervan (0-3). Galway: P. Connors, P. Ryan, C. Lordan, E. Casey, P. Gahan, C. Murphy, P. Grace (0-5), B. Bergin (0-2), D. Collins (1-2), D. McCormack (0-4), S. Curran (1-0), P. Ivors (0-2), J. Moylan (0-5). Sub: D. O'Connor (0-1). Wolfe Tones defeated Donegal with a workmanlike performance in a game that was up for grabs going into the final minute. The Tones had to work hard in the face of a determined effort from the Tír Chonaill men, who had worked themselves within two points with 5 minutes to go. However, it was the Tones who got the vital scores down the stretch to secure their first 2 championship points of the season. Anthony Williams with Martin Kelly in pursuit. Wolfe Tones held a slight upper hand for the first half in the face of determined and spirited Donegal. With 20 minutes gone the Tones held a three point lead. The half back line worked hard to keep the ball moving in the right direction and scores were converted by Dan McCabe, Sean Higgins, Danny Egan, and Marty Farrell. Donegal moved the ball well themselves and notched two points before the break to reduce the deficit to a point at the break. Gavin Gallagher and Sean Kelly were the scorers, and the northerners will have fancied their chances of causing somewhat of a surprise when taking the field for the second period. Sean Higgins looking for options. The Tones opened the second half with a flurry of points and it looked as if the South Boston men had control of affairs. Farrell, Jamie Gonoud, Egan and midfielder Thomas Moolick put the Tones into a five point lead. James McClean saw plenty of the ball in the middle of the field and was key to many of the Tones forays forward. Donegal, however, did not lie down easily and kept plugging away, proving hard for the Tones to shake off. Kelly, Gavin Gallagher, substitute Ronan Reilly, and Michael McKeown pointed to make it a one goal game with less than 10 minutes remaining as the northerners worked the ball well into the forward line. Excitement grew as it was up and down the field for the final 10 minutes as Donegal went in search of the tying score, but it was the Tones who got the points that decided the contest. After Reilly pointed, Thomas Moolick restored the lead to three and Dan McCabe put the insurance point over the bar in the final minute. A first win for the Tones, though a much better performance will be required to turn Aidan McAnespies next Sunday. Tipperary followed their Sheehan Cup win with another impressive performance in the opening senior hurling championship game. An early goal set the tone as Tipp opened up a 10 point half time lead, and though Wexford battled back in the second half and hit the back of the net on two occasions, Tipp held firm and maintained a relatively comfortable distance between the teams. as a puckout is contested. Tipp came out strong in the first 30 minutes. While the forward line tallied a goal and 13 points, the back line held Wexford's attack in check. In a game where every opportunity would count, Wexford missed scoring chances to keep the gap from growing as wide as it did and at the break faced a tall order. David Butler netted a fine goal, and free taker Kieran Morris hit the mark with several frees. The Tipp half back line kept it tight and kept Wexford to just 6 first half points. At the break it was 1-13 to 0-6 in favour of the Premier men. Wexford got themselves back into the game and forced Tipp to work hard in the second period. The Slaneysiders narrowed the gap to two scores with a point from David Drake and a goal from Eoghan Kavanagh and it was game on again. The referee had to issue yellow cards to Peter Ryan and Kieran Morris as the temperature of the game heated up. Wexford made every effort to carry the game to their opponents. The Tipp back line had to work hard to harry and block as Wexford went in search of another score to narrow the gap, and eventually the pressure was relieved with points from Morris and Peadar Boran which put seven points between the teams with little time left on the clock. Though the game was beyond them at that stage, Wexford kept up the pressure and found the net once more through Tony Murphy to provide some consolation. A bright start for Tipp and an important early two points. Wexford: E. Spruhan, D. Redmond, J. Hoyne, J. Foley, P. Nolan, B. Dalton, J. Kehoe, T. Maloney, S. O'Brien, E. Kavanagh, T. Murphy, D. Drake, P. Kehoe. Tipp: J. Logue, M. Power, S. Staunton, G. Brennan, R. O'Donnell, A. McGrath, C. Dempsey, S. McGarr, E. Murphy, S. O'Connor, C. Flynn, K. Morris, D. Butler. 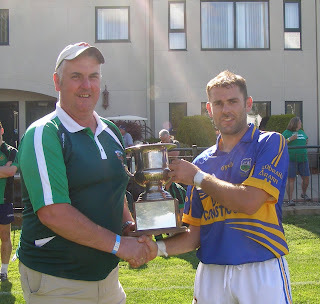 Tipperary won the first trophy of the hurling season with an impressive win over Fr. Tom Burke's. A fine first half performance saw Tipp go into the break with an eight point lead, and after the Premier men netted early in the second half the Tom's challenge waned and the outcome was a foregone conclusion for the final 20 minutes. At the break it was 1-11 to 0-6 in favour of Tipp thanks to some dominant play in the back line from Pat Moriarty, Geoff Brennan, and Robert O'Donnell. The points were spread across the front 5, while a goal from Sean O'Connor knocked some of the wind out of Tom's. by Boston Northeast Board Chairman, John Farrell. Tipp ensured that the second half would see no Tom's comeback with an early goal from wing forward, David Butler. Tom's tried to work their way back into the game with some hard work from Gordon Joyce in the half back line and Shane Howley at half forward, but to no avail. Tom's managed to put a couple of points together to make the scoreboard have a better look about it, but traffic was almost one way. Another goal from Kieran Morris, followed by a fine score from Robert O'Donnell added to Tom's misery. Cue the subs for both sides as for the final 15 minutes Tipp had the cup in the bag. Peadar Boran who entered as a sub and added 2 goals and point to embellish the win. First blood of the hurling season to Tipp going into the championship next week. Tipp: J. Logue, M. Powers, S. Staunton, P. Moriarty, R. O'Donnell, G. Brennan, C. Dempsey, S. McGarr, C. Flynn, D. Butler, E. Murray, TJ Lawler, D. Butler. Tom's: C. Horan, R. Blake, G. Cronin, G. Joyce, M. Deegan, S. Higgins, S. Couglin, D. Laffelly, S. Howley, A. McGreeney, C. Joyce-Power, C. Horan, M. Dervan. Galway and the Shannon Blues played out a very entertaining 60 minutes of football, with the Blues sealing the victory with two late Kieran Hurley goals in the face of a brave Galway side. Just when Galway looked like they had suffered the blow that would take the wind out of their sails, the tribesmen came back to make a game of it. The Blues, however, dispelled Galway hopes almost as soon as they sprung answering each time with a goal when it was needed. Kieran Hurley puts one over the bar in the first half. Galway's task was made all the harder after Jamie Kehoe was shown a red card 20 minutes into the first half after hauling down Andy Glennon as he bore down on goal. Galway hung in in the early part of the game and looked lively with Fergal Durkan at center back driving through the middle, as well as Barry Coffey and Conor McGraynor looking full of endeavor in the half forward line. Coffey pointed two frees for Galway while for the Blues Anto Duffy looked like the prime threat with two early points from play. With Kieran Hurley, Cathal McHugh and Andy Glennon adding scores the Blues gradually put their hold on the game. At the break the lead was extended to five points, and the Blues led by 0-7 to 0-2. Andy Glennon shadowed by Paul Cummins. It looked curtains for Galway early in the second half. Hurley netted a very well taken goal. Wing back Patrick McCarthy hoisted one for Glennon on the edge of the square. Glennon fielded cleanly and found the incoming Hurley who finished expertly into the far corner. Galway came right back with a goal however. Kevin Cummins won the ball on the edge of the box after a shot rebounded off the hands of keeper Darragh O'Brien. Cummins was bundled over the line and the goal stood. Galway were now four points behind and inched a point closer thanks to Coffey, the Newbridge man was key for Galway's efforts at center forward. With 10 minutes left it was all to play for. Coffey again pointed and it looked like a grandstand finish may be on the cards, but right away the Blues hit with another Hurley goal. Galway narrowed the gap once again with a brace of points from Coffee to once again set up the possibility of an unlikely comeback, but again Hurley and the Blues answered with a third goal to put the final nail in the coffin. Two hard earned points for the Blues, and a second half hat trick for Hurley. For Galway a good performance will temper the disappointment of the loss. Galway: M. O'Connor, R. Lyons, P. Cummins, S. Conneeley, F. Durkan, J. Kehoe, J. Campion, E. Kavanagh, B. Coffey (0-7), C. McGraynor, D. Reddin (0-1), K. Cummins (1-1), C. Costello. Blues: D. O'Brien, K. Hartnett, G. Ryan, S. Moriarty (0-1), S. Brosnan, P. McCarthy, S. Kiely, B. Hartnett, A. Glennon (0-2), R Blaine, A. Duffy (0-4), K. Hurley (3-1), C. McHugh (0-1). Connemara Gaels added another 2 points to their season tally to make it two games out of two with an impressive win over Kerry. The Gaels netted twice in each half, but in the all important early stages of the second half, put the game away with a goal and four points inside 10 minutes. Kerry opened the game looking serious about their intentions. Three points on the trot from Joe Fitzpatrick, David Clifford and Ronan Kennedy put the Kingdom into an early three points to one lead. Sean Conneely canceled out all that work with a fine goal after being fed with a great diagonal ball by Michael Lundy, and the Gaels dominated thereafter. Points began to come as the Gaels clicked and doubt crept into Kerry minds after the fast start. A second goal came from Kevin McGrath, and at the break the westerners held a two goal lead of 2-6 to 0-6. Joe Fitzpatrick tries to get around Ciaran O'Donnell. With just the two goal between them Kerry still were in the game, however, the Gaels removed any hope of a resurgence from the Kingdom with a tally of 1-4 before the second period was 10 minutes old. The Kingdom challenge collapsed to the point where a score was not registered in the second period. Again it was McGrath with the goal for the Gaels. A fourth goal came from the boot of Michael Lundy to put the final nail in the coffin. The Gaels making some noise early in the championship and Kerry will be looking to figure out how to make the most of the squad in order to have a shot at the playoffs. 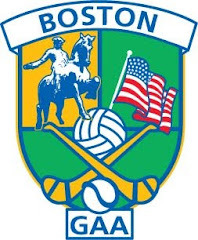 Gaels: E. Conneeley, C. O'Donnell, D. Doolan, C. Mulkerrins, E. Gorman, C. Seoighe, N. Graham, T. Mullins, S. Connelly, D. Comer, M. Lundy, I. Burke, K. McGrath. Kerry: P. Bailey, E. Mullan, D. Larkin, D. Dunne, S. Driscoll, D. Clifford, I. Whelan, S. Cunningham, R. Kennedy, G. Hickey, C. Campion, J. Fitzpatrick, G. Kelly. Wolfe Tones and Cork played a very entertaining game of football, a game in which Cork looked out of it entering the final quarter, but came back with two late goals to set up an exciting finish. The Tones hung on for the one point win as Cork could not make that final score to tie or win the game. Cork Footballers almost pulled off a late comeback - but fell just short. Wolfe Tones went into the break 2 points to the good having been outplayed by Cork for most of the 30 minutes. Cork squandered a lot of possession, especially in the first 15 minutes, over elaborating and ultimately losing the ball. Wolfe Tones were much more efficient, Ger Molloy, Brian Thornton, and two Gavin Walsh frees put them on top. Cork managed to put the ball between the posts twice, Lar Barden and Jack Lynch finding the mark but the return should have been more for the rebels. There were goal chances for each side. Brian Thornton and Mike O'Brien missed the mark on the Tones side, while for Cork Barden had a couple of chances that were well saved by Cliff Malone. At the break it was 0-4 to 0-2 for the Tones. The Tones dominated the early part of the second period with a rampant performance. Within 15 minutes of the restart the Tones had clocked up a goal and four points to a single point for Cork. Darren Maguire was full of running through the middle and was involved in the goal, which was finished by Aaron Morgan. Maguire, Thornton, and James McClean pointed. Cork made a run at it in the latter stages of the game and made an exciting finish of it. Paddy Minihane netted and was soon followed by Barden in a well work move involving Lynch and Johnny Crowley. One point in it with 5 minutes to go. The sides traded points as the clock wound down, but try as they might, Cork could not get that final score to get something from the game. Cork: J. O'Toole, M. Carolan, E. Barry, S. Leonard, S. McGarr, E. O'Donovan, P. Minihane (1-1), J. Lynch (0-1), J. Davis, L. Barden (1-2), J. Crowley, M. Moynihan (0-2), M. Cahilane. Wolfe Tones: C.Malone, B. Egan, A. Rooney, K. O'Regan, D. Maguire (0-1), K. Gill, P. Collins, J. McClean (0-1), M. O'Brien, G. Molloy (0-1), A. Morgan (1-1), G. Walsh (0-3), B. Thornton (0-3). The revamped junior championships started on a hot early summer Sunday with Aidan McAnespies and Donegal opening the Junior A1 section. Donegal looked impressive as the 2012 champions swept aside the challenge of McAnespies. A goal in each half, the first from Pauric McLaughlin and the second from Christy McLaughlin underlined Donegal's dominance and though McAnespies toiled for the 60 minutes to try and get something from the game, they could not keep up with their opponents. At the end of the first period it was Donegal in firm command of affairs. McAnespies opened the scoring with an Enda Hamill point, however, once Donegal got into the swing of things the Tír Chonaill took command of the game. Christopher McLoughlin accounted for 5 points, two fine scores from play and three well taken frees. Pauric McLaughlin may take credit for the goal. It looked like his left footed shot may have been scrambled clear, but the umpire saw that it had crossed the line and signaled for a goal. Donegal's Rocky Ivers suffered a bad injury to his knee area and word was that it was dislocated. Play was delayed for about 20 minutes before he was wheeled away to the hospital. Michael McGinty took his place in midfield. McAnespies kept in touch, points from Jonathan McGourty, and another from Hamill were followed by a goal from old head, Nigel Regan. McGourty found Regan headed toward goal and Regan fired low to the far corner with a finish reminiscent of younger days. At the break it was Donegal four to the good, 1-7 to 1-3. The second half began with McAnespies setting about their business with a purpose. Points from Peadar Nugent and a dead ball kick from keeper Ryan McCrystal reduced the deficit to two points as things heated up in the middle of the field. Again, Donegal clicked and settled, and began to play some nice passing football, linking well out of the back line. The lead was quickly restored to four points, and then it was extended as Christy Bell, Darren Green, and Pauric McLaughlin extended the gap to nine points. Donegal netted a second time as Christy McLaughlin finished a sweeping move that also involved Kevin Curran and Pauric McLaughlin. Donegal making a statement in the junior football ranks and looking serious about retaining the Pat Callaghan Cup. Macs: R. McCrystal (0-1), G. Treanor, G. McLinden, E. Daly, B. Morgan, P. McCusker, S. Lynn, N. Donaghy, C. Oliver, J. McGourty (0-1), E. Hamill (0-2), P. Nugent (0-1), N. Regan (1-0). Donegal: E. McCarney, N. McLoughlin, K. Connaghton, S. Wogan, E. Doonan, Paddy McLoughlin, R. Ivers, D. McBride, D. Green (0-3), C. McLoughlin (0-7), Pauric McLaughlin (1-2), D. McDaid (0-1), J. Lyroncky. Sub: M. McGinty. Subs: C. Bell (0-2), K. Curran (0-1). The second junior A1 game that was scheduled was awarded to Cork due to Armagh-Notre Dame not turning up for the fixture. Aidan McAnespies took the third of the three games played between the clubs at the Irish Cultural Center in Canton on Sunday afternoon. A solid performance along with a great display from Aidan Lynch in the half forward line saw McAnespies through against rivals, Donegal. Aidan McAnespies got off the mark in the senior football championship on Sunday. (Not in photo: Captain Niall Gallen was taking the toss). It was a rough first 30 minutes for Donegal as they struggled against an opponent that seemed to have a much better idea about their mission on Sunday afternoon. McAnespies played with a purpose. An early goal from Aidan Lynch set the tone, and points from Tobin, Lynch, Mark Treanor, and Barry Smith had McAnespies looking very comfortable. Treanor, a new arrival to the side, got his name in the goal column with a high ball dropping on top of the keeper, and as it turned out, into the back of the net. Donegal continued to struggle going forward as the McAnespies back line won ball after ball and set up the moves for the forwards. A goal did come for Donegal from Niall McConnell who batted a Gary Maguire high ball into the net from the edge of the small square, but it was a rare occasion that Paddy Coakley was called on to be alert in the McAnespie goal. At the break McAnespies led by seven points, 2-5 to 1-1. Donegal battled hard but found their opponents on Sunday a tough nut to crack. McAnespies added to the lead in the second half with Aidan Lynch the catalyst for much of the good things happening for them. The Urney man was an example in intelligent play and effective use of energy on a hot afternoon. Continuing to build from the back the South Boston based side added points from Lynch, Cian McEnroe, and substitute, Aaron Fearson. Donegal battled through and tried to salvage something from the game. Gary Maguire and Pauric McLaughlin pointed. Donegal managed a second goal. Maguire finished well after the ball broke from McLaughlin, but at that stage it was just a consolation. Cian Tobin had the final say with a point, and after last week's disappointment, McAnespies have two points on the board. Macs: P. Coakley, M. Bogue, E. Delmar, N. Gallen, C. McClean, A. Lynch (1-5), C. Dempsey, G. O'Neill, B. Smith (0-1), C. Tobin (0-2), D. Brolly, M. Treanor (1-1), C. McEnroe (0-1). Sub: A. Fearson (0-1). Donegal: S. Connolly, M. Canning, C. Murray, S. Tim, P. Moynagh, P. McNulty (0-1), C. Bell, T. Gallagher, P. Quigg, G. Maguire (1-1), R. Reilly, C. Geraghty, N. McConnell (1-0). Sub: P. McLaughlin (0-2). There was a twist at the end of a very exciting game with Christopher's overturning 50 minutes of great work by the Wolfe Tones in the space of the final 10 minutes. The Tones played with a purpose and got some great performances from Danny Egan and Cormac Joyce-Power, as well as Jamie Ginou in the half back line, but Christopher's dug deep in the final 10 minutes. After two goals, one somewhat fortunate, the men in red and black saw the chance to steal the game and steal it they did with a Chris Brady injury time goal. their first points of the season. The Tones forward line was buzzing in the first half and netted twice thanks to some hard work and support play. At center forward Danny Egan had plenty of options. The first goal came after the Kildare man was shoved from behind in the penalty box. Egan took the penalty himself and hit the back of the net with authority. The second came when Marty Farrell was found on the overlap and the Down man hit the far corner of the net. Though they looked a little short on ideas going forward, Christopher's picked away at the points with what chances they had. Michael Quinlivan accounted for three, Dan Kenneally, Mark Delaney, and substitute Paddy Manning one each. While the Tones added four points to their two goals there were some missed opportunities to make their advantage count. At the break it was 2-4 to 0-6 in the Tones favour. Marty Farrell nets the Tones second goal late in the first half. The Tones took the game by the scruff of the neck shortly after the restart. The big players stepped up, Danny Egan at center forward was full of running and Cormac Joyce-Power looked strong in the middle of the field. The Tones outscored Christopher's five points to two and with 15 minutes left held a commanding seven point lead. Christopher's looked dead on their feet and it appeared that the heat had taken its toll on some key players. They stuck with it however, and tried to turn the tide with a couple of switches. Paudie Kenneally was taken out of goals to the forward line for GervaseToner, Toner was moved to goalkeeping duties. Older brother Dan moved from corner forward to a more central position in the middle of the field. The Tones pulled Dan McCabe, a surprising move since the Down man was very involved in the game. Shortly thereafter, the complexion of the game changed, and all in space of a minute. Goals from Gary O'Leary and another from Chris Brady a minute later erased almost all of the Tones good work. O'Leary scored after being played through by Quinlivan, and Brady pulled on a ball after a defensive lapse. With 10 minutes left it was a one point game, and the spectators were now on the edge of their seats for a possible unlikely finish. Danny Egan put a free over, but then Christopher's leveled the game with a point from O'Leary and another from Brady on 30 minutes. It looked as though Egan had put the matter to bed with a well taken point, but it was Christopher's who had the final say with a third goal 2 minutes into injury time. Chris Murphy made a big run from his own full back line and went unchallenged for half the length of the field. The ball ended up with Brady through Quinlivan. Brady made no mistake with his low shot. As it billowed the back of the net it was disbelief from the men in blue. Two points for Christopher's to bring their tally to three points from 2 games, and the Tones still looking to get off the mark. Tones: C. Hynes, S. O'Hagan, B. McShea, C. Boyle (0-1), S. Higgins, J. Ginoud (0-1), C. Joyce-Power (0-1), J. Kelly, M. Farrell (1-0), D. Egan (1-7), M. O'Brien, D. McCabe (0-1), M. Kelly. Christopher's: P. Kenneally, C. Murphy, C. Lordan, C. Davies, M. Mennis, E. O'Neill, M. Delaney (0-1), G. O'Leary (1-1), C. Brady (2-1), G. Toner, J. Horgan, M. Quinlivan (0-5), D. Kenneally (0-1). Sub: P. Manning (0-1).